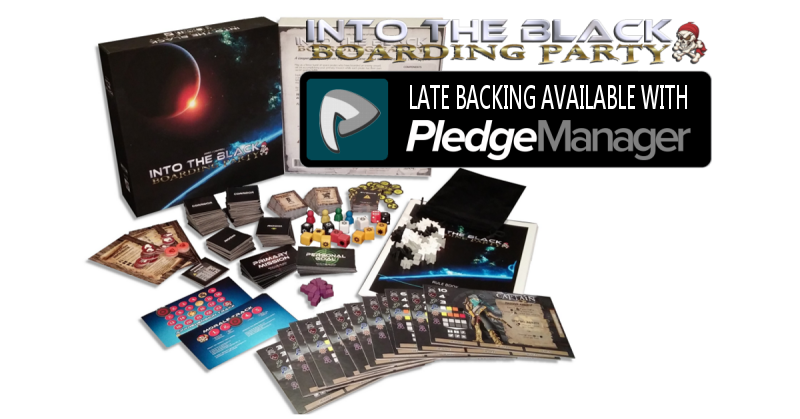 9 Days Left to Pledge for Into the Black: Boarding Party – Funded and 10 Stretch Goals Unlocked! 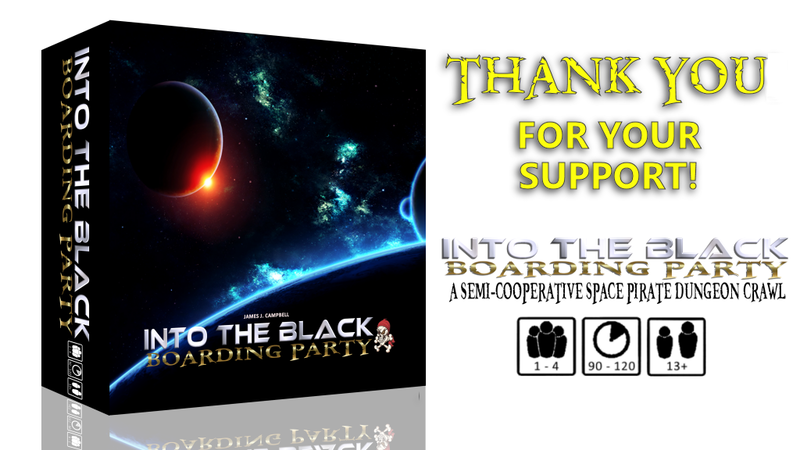 Into the Black: Boarding Party has just 9 days left in it’s Kickstarter Campaign! 160% Funded and 10 stretch goals have been unlocked so far! With the expected surge in the final 48 hours of the campaign it appears this game will come fully stretched/upgraded and the designer has hinted at a couple of bonus extras that may be snuck into the final production! Kickstarter backers receive all unlocked content at no extra charge (expansions notwithstanding). KS Promo Items will be made available through retail at additional cost after fulfillment. 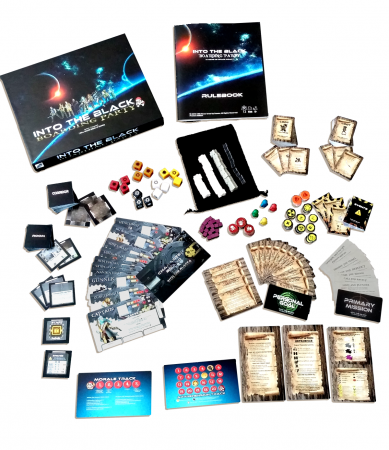 The first in a SERIES of Games – Into the Black: Boarding Party is the first in a series of games in the Game of Space Piracy world, with a prequel and a sequel game currently in development! Once More Unto the Breach! Into the Black: Boarding Party is live on Kickstarter now through March 29th! James J. Campbell and I Will Never Grow Up Games are headed to Kickstarter to seek funding for their board game, Into the Black: Boarding Party, a semi-cooperative space pirate dungeon crawl for 1 to 4 players. 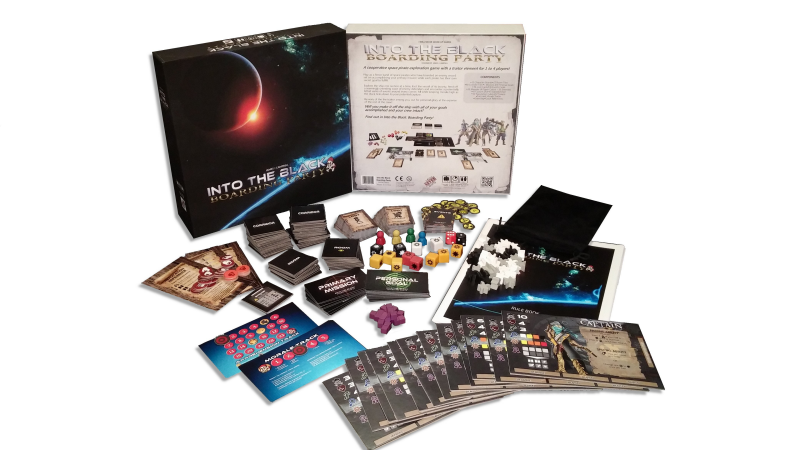 Gamers familiar with the dice and tile laying aspects of Betrayal at House on the Hill and the traitor mechanics in Dead of Winter will feel right at home with Into the Black: Boarding Party, the first in a trilogy of games in development set in the Game of Space Piracy universe. 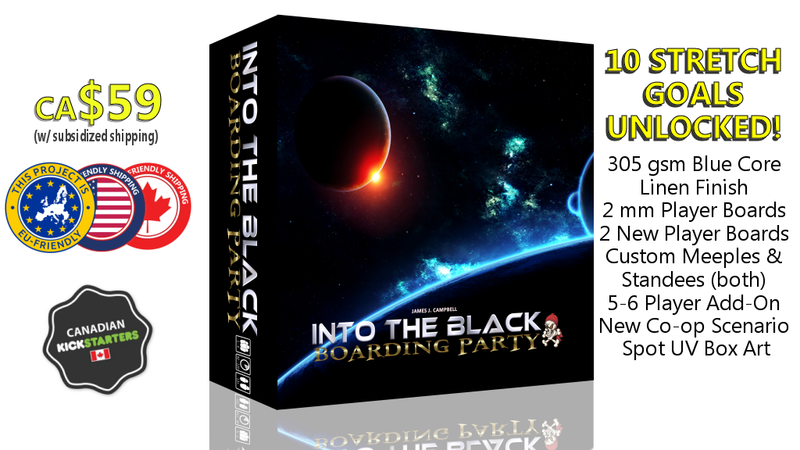 Into the Black: Boarding Party has been blind play tested by dozens of groups during hundreds of sessions across the world, and it will launch on Kickstarter with the full art and design complete. The Kickstarter campaign will feature the game at $59 Canadian (approximately $45 US), with low, subsidized shipping. In the not so distant future, mankind has traveled the galaxy seeking out new worlds to colonize and exploit for their rich resources. In the process a new breed of spacefaring pirate has emerged to take advantage and profit off of the hard work of others. In Into the Black: Boarding Party you play as a fierce band of space pirates who have just boarded an unknown enemy vessel, set on accomplishing not only your primary mission but your own personal, secret, goal as well. You will explore the ship one corridor and room at a time, loot the vessel of all of its bounty, fend off a seemingly unending wave of enemy defenders and encounter a potentially lethal series of events around every corner. 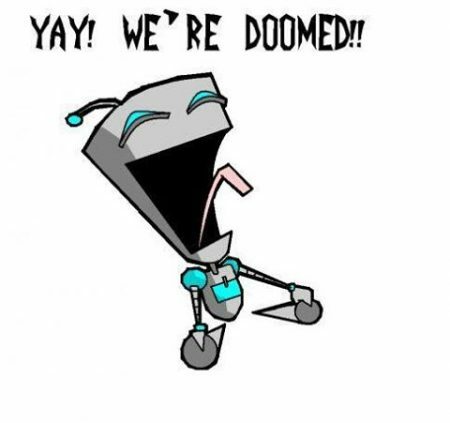 All the while keeping morale high and the clock ticks down to your eventual failure. Beware the potential traitor among you, out for personal gain and glory at the expense of the rest of the crew! Will you make it off the ship with all of your goals accomplished and your crew intact? Find out in Into the Black: Boarding Party. Every crew member of your Pirate Ship has their own special talents. Some are more effective than others, for sure, but each has crew mate has his or her place on your crew for a reason! As we have adjusted the special abilities of many of the crew members to be more balanced and in-line with updates that have been made we came to realize that SOME of those special abilities are triggered without the player even needing to make a choice. Thus was born the PASSIVE ABILITIES vs SPECIAL/ACTIVE abilities. Each player’s character board will have a Passive Ability listed. These passive abilities trigger whenever a certain condition applies throughout the game. Some of these are a one shot deal, while others will be ongoing throughout the game. Be sure to know your character’s passive ability so that you don’t miss out on bonuses! The Captain is Feared, and respected. As such, every time the Captain rolls a critical hit during an attack action, he or she earns one additional reputation, even if this exceeds the regular maximum of 5 (up to a maximum of 6, and only once per game round). This allows the Captain to maintain a high reputation, as any good Captain should have! 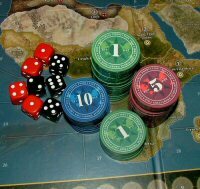 Additionally, the Captain has specials allowing her (once per round) to re-roll any die roll (including another players) OR once per turn change any hit to a critical hit (and this stacks with the passive ability – super reputation earner). Mr. Pitt, the Quartermaster, is incredibly disorganized (not the best trait for a quartermaster generally) and an epic Hoarder. He may always take a second piece of loot in every search action! As the Quartermaster, he may also choose to trade any number of items between himself and any other player in the same location without action cost or discard useless junk from his hand without any decrease in morale (The Quartermaster knows best, right? That stuff must have been worthless). The simple Ships’ Mate, a generally humble position is overly Eager. As such, he takes on ALL SPECIAL abilities of ALL other crew members located on the same tile! If he’s alone, however, he does tend to take more time searching for goodies (add an extra die to any search roll). Any time one of the conditions is met in game for a passive ability, that player takes the benefit of the ability. These abilities are not optional, unlike the Special abilities that the player may choose to take.